I’m grateful to “Greenmachine,” outdoor installations using technological components by three artists, if only for getting me to the Schuylkill Center for Environmental Education, a very beautiful site at 8480 Hagy’s Mill Road, a bit north of Manayunk. As we say at Pesach, “It would have been enough.” But the art itself is well worth the trip – in fact, the best installations I’ve ever seen in a natural setting. Keiko Miyamori, Katie Murken and Chris Vecchio made interventions which each highlighted different aspects of the environment in ways subtle enough that they never competed with nature or risked interfering with the simple pleasure of a walk in the woods. Rather they highlighted that pleasure, punctuating it with elements of wonder and delight. Miyamori creates rubbings from tree bark. 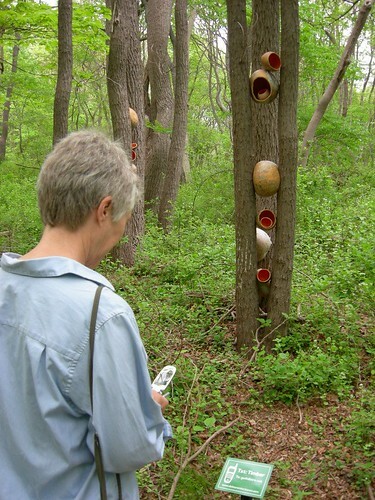 She conceived of this work, “Here and There” as an exchange between the Schuylkill Center site and one in Japan, and the locations were linked by simulcast for the opening, which included a percussion performance — an event I missed, alas. She did rubbings here and in a forest in Ibaraki, Japan, then took the Philadelphia rubbings to Ibaraki and brought the Ibaraki rubbings here. 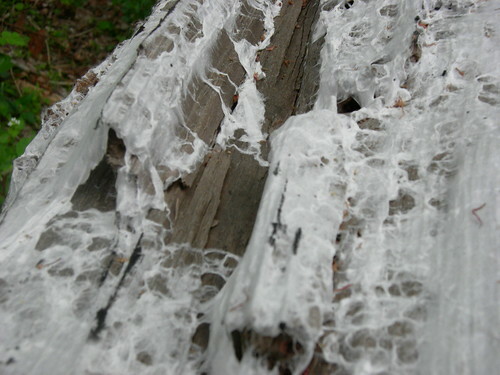 She has installed them out-of doors on selected trees at each site, and four days after the installation the delicate rice-paper already showed signs of exposure to the weather, with the paper settling into the bark of the trees. It is organic material, so will break down and become part of the forest floor, following the natural order of decay leading to new life. The notion of exchange was probably made clear through the performance and simulcast (a video recording is soon to be on display in the media lab, indoors in the main building). 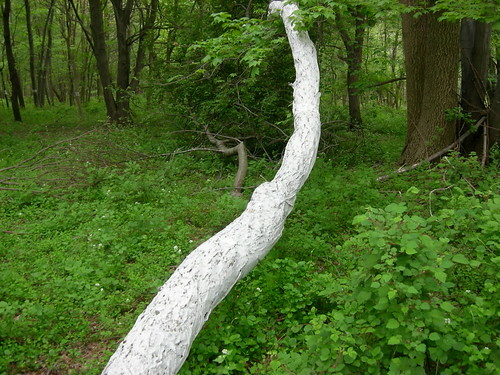 That exchange wasn’t apparent from the out-doors evidence, but the paper-wrapped and tagged trees made for a lyrical intervention along one of the marked paths, and the knowledge that the piece would be absorbed into that landscape was a poetic reminder of the cycle of nature. Katie Murken’s work, “Debtor’s Inheritance,” has two components, one visual, the other aural. Their relationship was unclear to me, but each works independently, contributing unexpected views and thoughts as one progresses along the path. Murken cut the tops off a large number of gourds, painted the interiors orange, decorated them with designs and placed mirrors in the bottoms of a few. She then piled, massed and distributed them throughout the landscape, creating beautiful and varied tableaux along the path. Some were lodged in the crook of a tree, others placed on a group of stumps, still others floated in a mass in the pond. 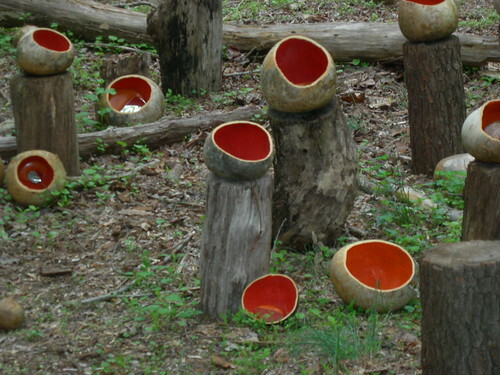 The mirrors caught the light and in reflecting the surrounding forest created the illusion of windows in the gourds. It was as if a new species of giant mushrooms had sprouted throughout the forest (and indeed I did find somewhat smaller yellow mushrooms on a log). Murken also placed signs along the path directing the viewer to enter a code on a cellphone which activated a series of text messages. These tell a story of the history of the site – true or fictional is unclear (true, it turns out). With this very slight visual intrusion Murken was able to leave the choice to the viewer of whether or when to listen. I’m sure that my pleasure in the installations was heightened because I visited in the company of Louise Barteau Chodoff, an installation artist who is working on a project that will involve an outdoors element. It was Louise who learned to text message so that we could access Murken’s narrative, and I am grateful to her. We both found the stories and the method of their delivery to be delightful. Chris Vecchio’s “Supplemental Shrubbery Sound Source” provided another interactive aural element, more unexpected in that the sounds were activated by the viewer’s proximity. 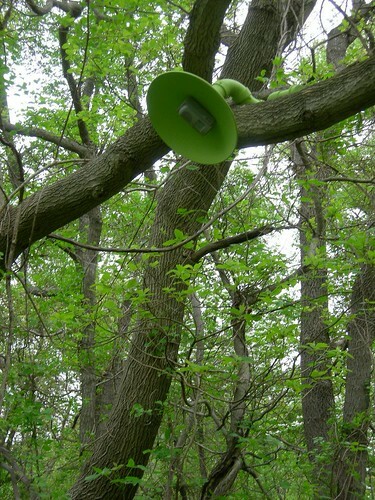 They came from speakers lodged in wonderful, sculptural housing and tucked into the trees. I won’t say more so as not to spoil the surprise, but suffice it to say that it had us giggling with delight like children. There are short videos about the artists and the evolution of these pieces in the main building; I recommend going in and getting a map of the walk, but saving the videos for afterwards. “Greenmachine,” which is presented by the Schuykill Center in partnership with InLiquid.com, will be up through October 30; The Schuykill Center for Environmental Education is at 8480 Hagy’s Mill Road, tel (215) 482-7300; the trails are open daily from 8:30 am to 4:30 pm and the main building is open Mon. – Sat., 8:30 am – 5:00 pm. –Andrea Kirsh is an art historian based in Philadelphia. You can read her newest Philadelphia Introductions and other commentary at InLiquid.